The butterfly effect. “The phenomenon whereby a minute localized change in a complex system can have large effects elsewhere.” You take one action designed to address one problem, and maybe you get your intended result. Maybe not. But you also get a hundred different other consequences as well. When a central bank interferes with a marketplace, its actions are not housed in a laser-precision silo. New currency issuance ripples out through the economy in all sorts of unintended ways, and banks being banks, that currency is then leveraged many times over. And then it seeks the highest return (and attendants risks, often ignored) it can find. After nearly a half century of unlimited dollar creation, multiple bubbles and busts...the current asset reflation has been the most spectacular...but alas, perhaps too successful. The Fed's answer to control or restrain this present reflation is raising interest rates to stem the flow of business activity, lending, and excessive leverage in financial markets. 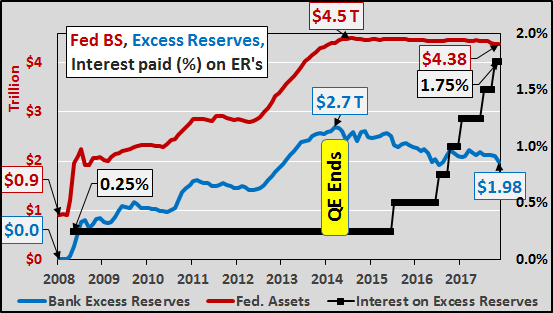 But in the Fed's post QE world, a massive $2 trillion in private bank excess reserves still waits like a coil under tension, ready to release if it leaves the Federal Reserve. Thus, the only means to control this centrally created asset bubble is to continuously pay banks higher interest rates (almost like paying the mafia for protection...from the mafia) not to return those dollars to their original owners or put them to work. With each successive hike, banks are paid another quarter point to take no risk, make no loan, and just get paid billions for literally doing nothing.